I had a difficult time peeling off the shell of this hardboiled egg without tearing away chucks of egg white, also called albumen. By the time I finished, the white was thin and lumpy. Because I had already peeled a lot of eggs that day–easily and perfectly smooth ones–I nearly tossed this one into the sink. There wasn’t much left of it. Then I considered how hard my hen had worked to produce the egg. So I took hold of my knife, sliced down the longest length of the egg and opened it to remove the yolk. Surprise! 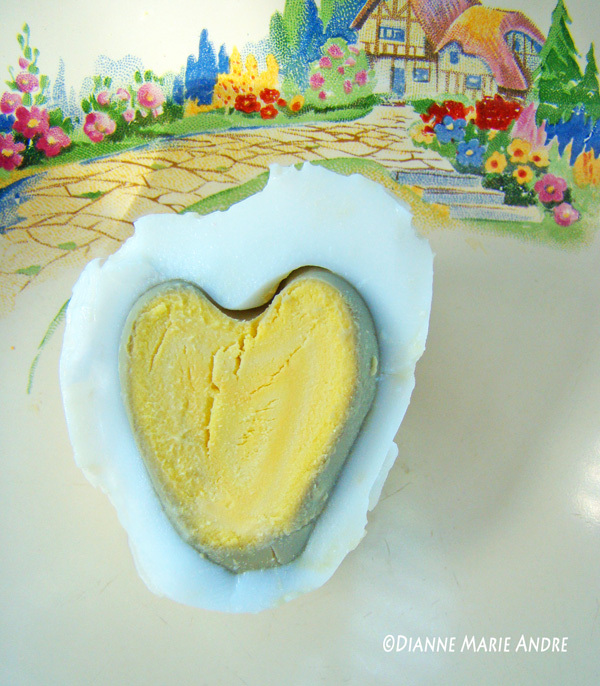 The hen had left a message of love with a heart-shaped yolk. I like to think this had nothing to do with the boiling process or air pockets, but rather a message of appreciation for the scratch I provide, for the fresh water, food scraps, free range pasture, and a safe place to roost at night. Now, no matter how difficult a hardboiled egg may be to peel or how badly it appears, I always look for a message in my hens’ eggs. After all, it is what’s inside that matters the most. Check out The Food Lab’s great tips on boiling eggs. May 30th is Water a Flower Day, an annual reminder that summer heat is fast approaching and our beautiful flowers (and plants and trees) will be thirstier than normal. They’ll love you even more if you mulch the flowerbeds and use moisture control potting soil to retain water and reduce watering. My Novel Is Finally Published! Jenna Hamilton loves being a wife and mother. Everyday Jenna makes routine decisions for her family’s wellbeing. Then, one day an ordinary decision changes their lives forever. 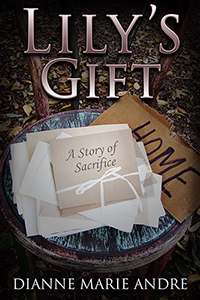 The guilt Jenna carries and the events that follow that fateful day will keep you turning the pages. And, like Jenna, possibly discover the healing power of love and self-forgiveness. I want to fix up the chicken coop. So, I thought I would give you a tour and tell you the improvements I envision and why. Maybe you can lend some suggestions. If you like, I’ll even share your photos or sketches here, whether it’s an existing chicken coop or one you dream about. Vision: Dress up the facade. Reason: Not necessary, I know, but I just can’t help dreaming about an attractive hen-house. Vision: A small running pen to the right of the coop. Reason: When I buy chicks, I keep them inside the coop until they are old enough to go into the existing running pen during the daytime. In the mornings I have to: 1) lock the older hens out of the running pen, 2) shoo the chicks out of the coop into the running pen, 3) secure the hatch between the two quarters so they can’t go back into the coop, 4) open the coop door so the adult chickens have access to the nesting boxes, 5) rotate the different feeders and water jugs, 6) repeat these steps in reverse before sunset. A second running pen is also a plus for when I need to keep a chicken separate from the flock because it is ill and being attacked by other hens. Vision: Enclose the running pen with small-gauged galvanized wire. Reason: Keep birds from entering through the existing chicken wire and eating the chicken feed. Vision: Okay, this is where I get a little crazy. I would like the interior coop walls and ceiling painted or covered in a smooth veneer wood or some type of smooth finish. There would also be a need for a hatch door and steps to the running pen I wish to add to the right of the coop. Reason: Smooth walls make for easier cleaning. Vision: Add a small closet between the coop and the new running pen for shovel, broom, rake, shaving bag, and a few other necessities. Reason: Sometimes, the hens get into the shaving bag, knock over tools, and of course there’s occasional poop that drops on something I need to handle. This rounds up my hatching out a plan–a future project. Suggestions are welcome. Fog is . . . Beyond the drizzle of a hazy disguise. These things the cloud cannot hide. Merely the drizzle of a hazy disguise. You are currently browsing the archives for the Country Buzz category.